Brought to you by the Center of Career Engagement and Internships and HireQC, the Career and Internship Fair here at Queens College on March 13th proved to be a crowded and popular event. Promoted across campus since the beginning of the spring semester, the fair intrigued students and visitors as an opportunity to seek early employment and/or experience. In the Student Union building on the 4th floor ballroom, hundreds of people in suits and professional business-wear flooded the room in hopes of finding not only a company of interest, but perhaps also an opportunity outside of their fields of study. With industries ranging from human services, to education, law enforcement, technology and community work being present, this event attracted most people based on their field of interest. Businesses and organization vendors pulled some eyes with goodies such as reusable water bottles, stress balls, company-influenced drawstring bags and more on their tables of information. 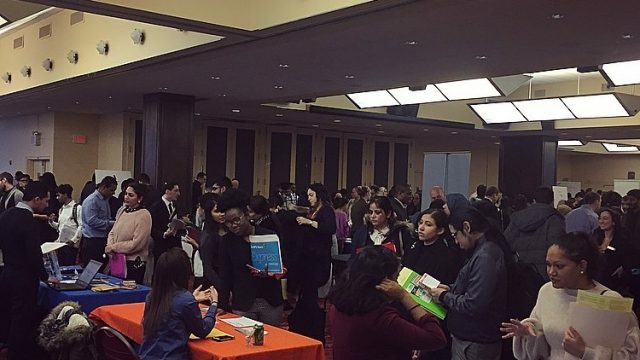 Undergraduates, grad students and various others in the Flushing region filled the rooms with hopes of applying to jobs and potentially getting hired. Well-known companies, organizations, firms and even government agencies from across the country such as GEICO, MacMillan Publishing Group, the U.S. Army, StateFarm and others opened their doors to all attendees for two hours. There were long lines of people stretching across the room, all waiting to meet representatives, hear some information and, with any luck, potentially end the meeting by exchanging contact information. However, many business vendors did not give applications on the spot; the participants had to apply online. With students flooding the tables with cover letters, resumes and business cards, some of them took time to speak about why they were interested and what they hoped to accomplish at this event. “I came here searching for business related jobs/internships, mostly having to do with numbers, data entry and mathematics…” said Sophia, a senior mathematics major. An upper-level student also gave a comment regarding her goals at the event. “I’m a graduate student and I’m looking for a job that suits my interest in social work” said Sofia, a first year graduate student and sociology major. Businesses, for their part, came searching for specific skill sets ranging from graphic design and marketing to data entry and more. For example, the NYC Department of City Planning was open to various experience levels in job applicants; however, the applicant had to be studying a business-related field such as economics, finance or accounting. Others were more open, accepting people regardless of their field of study. MacMillan, for example, had a wide range of fields one could work in. The U.S. Army, the NYPD, FDNY, FBI and related departments were opened to anyone who would be interested in joining, with their incentives largely involving helping with the student’s education. There were also volunteer organizations, such as the YMCA and other school programs open to anyone looking to help. This fair offered something for everyone’s interests, whether it was in working for a business, volunteering, serving the country with a government agency or just for the undecided and curious. With the applicant pool QC has to offer, next year’s fair is sure to once again be an important attraction for both businesses and students alike.